Sculptors chip away at stone to expose the art beneath. Physique athletes are both art and artist. Join this BodyGroup! Apprentice with the masters! Welcome to the official Human Statue Fitness BodyGroup! If you are interested in transforming your body into a masterpiece, then become a member of this BodyGroup. Also, make sure to visit www.humanstatuefitness.com to receive all the latest updates on the upcoming book, The Human Statue Workout: Your 365 Day-a-Year Guide to Transforming Your Body Into a Masterpiece. "Every member of this group committed to ..."
Everyone who joins this BodyGroup must be committed to training hard, sticking to their nutrition plan, and helping other members stay motivated en route to transforming their bodies. What is your BodyGroup about and who are the members? The Human Statue Fitness BodyGroup is a community of like-minded individuals seeking to transform their bodies into masterpieces. Members range from beginners to advanced trainees, and their goals include losing fat and building muscle. Why did the founder start up the group? As one of the first BodySpace members back in 2006, I received a plethora of questions on fitness throughout the years and have done my best to provide helpful answers. Earlier this year, I decided to use the BodyGroup feature to be able to share my answers with a larger community and allow other members to also participate and give their own advice. What have your results been with starting the group? I started the group in June 2011 and the community has been growing at a very rapid pace. As of November 2011, the total member count is close to 800. This is encouraging; it indicates people are interested in the group and members are benefiting from it. How do your members use the BodyGroup feature? Members ask questions in the BodyGroup forum by creating their own threads, or by posting questions in the training and nutrition Q&A threads. Every question receives an answer from either myself or other community members. Many members also post in the comments section with their opinions on the group, to ask or answer questions, and to receive feedback on their progress. Who are some of your notable members? "In the last 6 months I have completely transformed my body from an overweight slob to a motivated and hardworking individual. I have lowered my body fat from 15-20% to around 6.1%! 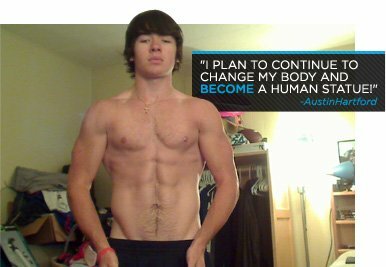 I plan to continue to change my body and become a Human Statue!" "A beautiful sculpted physique is at the top of my priorities to keep pushing myself further and further! I love it and I hope to motivate others and be motivated by those who have achieved the physique they desire." "Done with bulking to 200, now ready to kick it into high gear and cut down to 175 or so with 8% bf. Gonna need like-minded folks to keep me accountable and kick my a$$ if I slack." "I'm joining so that I can be motivated by like-minded people, and hopefully be an inspiration to others too." "Lost over 100 pounds, and I want to keep it off for good." How would you explain the attitude needed in your group, to a new member? Anyone can join the Human Statue Fitness BodyGroup, as long as they're committed to staying true to their training and nutrition regimens, and are willing to help others do the same. The group is all about providing positive energy and encouraging members to put forth their best efforts in the gym and with their diet so they can achieve the best possible results. In what way has motivating other BodySpace users, given you the ability to push yourself to new levels? Helping others achieve their goals is one of the best feelings and it is very motivating. I strongly believe in providing people with positive energy, and they often send energy back with their encouraging comments and, overtime, with the results they achieve. I then use that energy during my workouts to push myself to the limit. What would you tell someone who is contemplating making a commitment to joining your group, to motivate them make the commitment? Undergoing a transformation is no easy task, especially when it's done without the help of others. So, by joining the Human Statue Fitness BodyGroup, you will surround yourself with a large community that has similar goals. Any question on fitness that you may have will be answered, so you'll know exactly what needs to be done to achieve your transformation goal. In addition, you will receive encouragement from the community that will help motivate and inspire you. How do you think the group mentality applies to your personal life and how has it helped? I enjoy helping other people and have done so using BodySpace for many years. However, with the use of this group, I can help more people by sharing my knowledge with a larger community. In turn, I receive thanks and encouragement from the members, which sends me positive energy. Why join your group as opposed to other transformation groups? As a member of the Human Statue Fitness BodyGroup, you are guaranteed to receive answers to all your training and nutrition questions. If you're lacking motivation or are not getting the results you want, then this group will be of great benefit. Whether you're looking to gain 30 pounds of muscle or lose 30 pounds of fat, being a part of the Human Statue Fitness community will help you reach your goal. How do you feel, is the best way to motivate others within the confines of the group page? Answering member questions is very motivating for those seeking answers. Also, providing feedback and comments on member progress lets the members know how they are progressing and helps them continue working toward achieving their transformation goal.